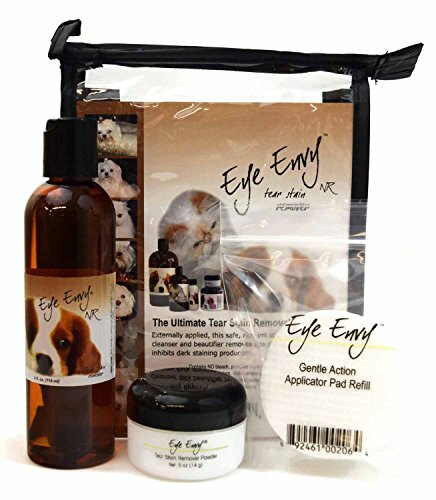 Eye Envy pet tear stain remover that you don't need to refrigerate! How great. Features three pieces: a 4oz. solution 1/2 oz powder and Rayon application pads. Eye Envy is the ultimate in tear stain removal systems. Externally applied this safe non-irritating and effective cleanser and beautifier removes unsightly stains and inhibits dark staining production. The Starter Kit includes all the essential products needed for the cleansing and beautification process. Eye Envy may also be applied to your pet to eradicate most feet and mouth stains as well. When initially removing stains it is strongly recommended to use both solution and powder. Together, you will receive the maximum results. This solution does not require refrigeration. Eye Envy does not contain any bleach peroxide steroids or other harmful agents and is topically applied. Natural supplements for a dog. applied to your pet to eradicate most feet and mouth stains as well. When initially removing stains it is strongly recommended to use both solution and powder. Together, you will receive the maximum results. This solution does not require refrigeration. Eye Envy does not contain any bleach peroxide steroids or other harmful agents and is topically applied. Natural supplements for a dog.